The mystical and tranquil setting of Jageshwar makes it an ideal holiday destination to explore and rejuvenate the body and mind. Many years ago, Jageshwar used to be a pilgrim halt en-route to the famous Kailash-Mansarovar pilgrimage. Today, due to easy access from Delhi via train to Kathgodam and then just a two-three hour drive along beautiful Kumaoni villages and Deodar forests makes it a popular off-the-beaten track kind of destination. The surrounding deodar trees and the Jata Ganga which flows through the temple lends to the beauty of the place. The place also acts as a meditation center due to the calm, fresh and beautiful environment surrounding the temple. Temple City: Jageshwar is known for temple complex comprising of 124 large and small stone temples dating 9th to 13th century AD. Culture enthusiasts and historians visit the place to learn more about the ancient shrines and dynasties that built them. Yoga and Meditation: Because of its tranquil and calm environment free from hustle bustle and city clammer and surrounded by dense deodar, Jageshwar is an ideal place for meditation where one could come close to nature. Camping: Camping is another good way to spend time with your family and friends to spend some quality time in the lap of nature. Being situated amidst the dense deodar trees, Jageshwar is an ideal place to camp and enjoy the beauty of nature. Due to its temperate climate, Jageshwar can be visited all year round. Summers are cool and pleasant while winters are cold with little snowfall. Finding an ATM or a petrol pump can be difficult at Jageshwar. Make sure you have taken care of these things at Almora before proceeding to Jageshwar. Jageshwar doesn’t have lot of accommodation option available as the destination has only recently started attracting tourists. One can find few budget guesthouses set up in Jageshwar. Since Almora is only 35 km from Jageshwar, people usually book accommodation at Almora and visit Jageshwar as a day trip. Almora has all kinds of accommodation ranging from luxurious hotels and resorts to guesthouses and lodges. Finding a fancy restaurant that serves variety of cuisines would be difficult as the place is relatively small as compared to major tourist destinations like Nainital or Mussoorie. One can find local restaurants and roadside food stalls in Jageshwar which serve Indian dishes along with popular Chinese items. There is no definite dating of the construction of Jageshwar group of temples but according to the ASI, they belong to the post-Gupta and pre-medieval eras and are estimated to be about 2500 yrs old. These temples range in the period from the 8th century (early Katyuri Dynasty) to the 18th century (Chand Dynasty). The temples were renovated during the reign of Katyuri King Shalivahandev. There is an inscription of Malla Kings on the main temple premises indicating their devotion to Jageshwar. The Katyuri Kings also donated villages to the temple priests for its maintenance. The Chand Kings of Kumaun were also patrons of the Jageshwar temple. Over 25 inscriptions of different periods are inscribed on the walls and pillars of the Jageshwar temples. Most of these belong to the period between the 7th century AD to 10th century AD. The dialect of inscriptions is Sanskrit and Brahmi. It is believed that Guru Adi Shankaracharya visited Jageshwar and renovated and re-established many temples before leaving for Kedarnath. The Samshan ghat of Jageshwar is also the cremation ground of the erstwhile Chand Kings. The main temple in the temple complex at Jageshwar Mahadev is dedicated to Bal Jageshwar, or the Child Shiva. As per Legends, it is also believed that Lord Shiva have came down from his abode and meditate here, surrounded by the thick Deodar forest. 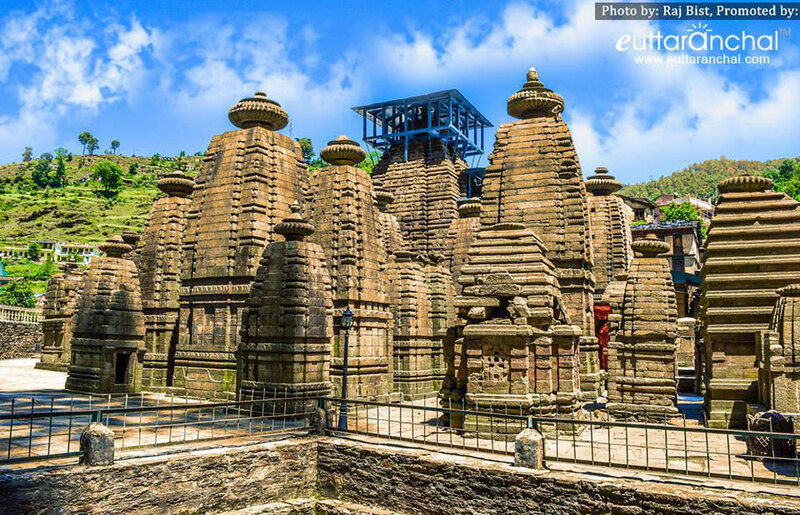 The cluster of Jageshwar temples depicts the ancient culture and design. 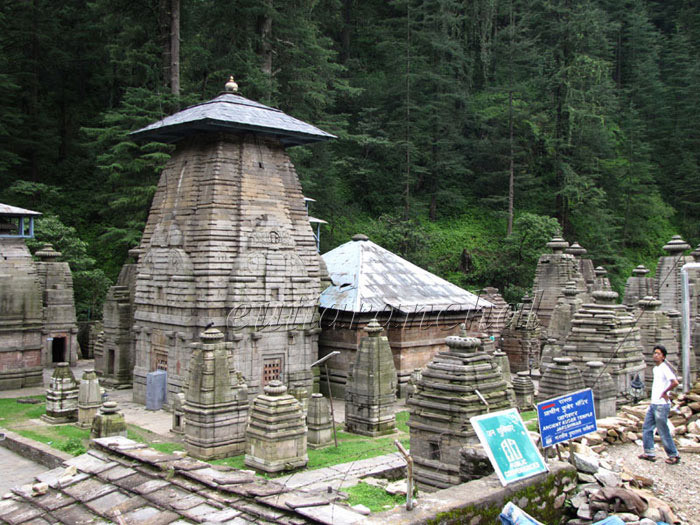 There are around 124 temples and hundres of statues in Jageshwar Dham. The beauty of the place is enhanced by the Deodar trees and the Jata Ganga which meanders its way into the temple complex. It is also acts as an important centre for meditation because of its tranquillity and calm environment. The main temples of Jageshwar include Dandeshwar Temple, Chandi-ka-Temple, Jageshwar Temple, Kuber Temple, Mritunjaya Temple, Nau Durga, Nava-grah Temple, a Pyramidal shrine, and Surya Temple. The Maha Mrityunjaya Temple is the oldest while Dandeshwar Temple is the largest shrine of Jageshwar. Architecture: Most of the temples have the stone lingams and very impressive stone images around the altar. A carved doorway leads you to the square sanctum sanctorum. There is a tall curvilinear spire shikhara, surmounted by an amalaka (capstone) and a kalasha crown. Some ashtadhatu (an alloy of eight metals) images are outstanding. One of the rarest specimens in northern India, the Ekamukhalinga can also be seen here. What is Jageshwar famous for? Jageshwar is famous among tourist as Pilgrimage, Bird Watching. Jageshwar is recommended destination for Couples, Foreigners, Groups. Jageshwar is popular destination for following activities/ interests - Bird Watching, Emerging Destinations, Historical, Leisure, Monuments of National Importance, Pilgrimage, Shiva Temples, Shiva Temples, Temples. Travelling to Jageshwar in 2019? Contact us for planning your Jageshwar tour with best travel packages of as per your requirements!